Have you ever felt the desire in your heart to go on a mission trip to help spread the Good News? First Baptist Newnan commissions numerous trips each year to accomplish that very goal. There are opportunities to serve locally, nationally and internationally. We invite you to look over the calendar for 2018 and pray about the trip God is leading you toward. Please contact a member of the Missions Committee for answers to all your questions. Going on a mission trip will help you CONNECT with other members of First Baptist and will definitely help you GROW in your walk with the LORD. So COME and GO with us . 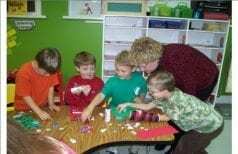 . .
Mission Friends is the mission organization for preschool children who are 3, 4, and 5 years of age. Mission Friends meet on Wednesday evenings from 6:15 to 7:00. The preschool children become aware of God's love and learn that others need to hear about this good news! They are involved in learning, praying, giving and doing missions. 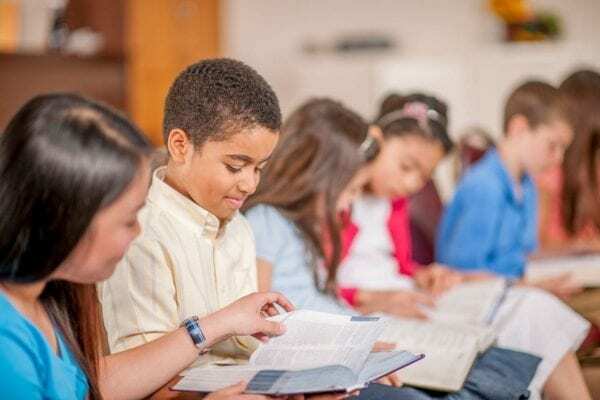 They learn simple Bible verses and engage in fun and creative activities about missionaries throughout the world. 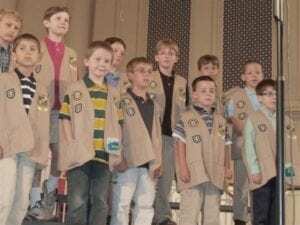 The preschool children are frequently involved in hearing real missionaries and participating in mission projects such as collecting supplies for Christmas shoe-boxes for Operation Christmas Child. Come join us for unforgettable opportunities on Wednesday evenings! For more information and activities for families of Mission Friends, see missionfriends.com. As a Royal Ambassador I will do my best: to become a well informed, responsible follower of Christ; to have a Christ-like concern for all people; to learn how to carry the message of Christ around the world; to work with others in sharing Christ; and to keep myself clean and healthy in mind and body. This pledge is part of personal and chapter (group of RAs) accountability. The RA Motto, "We are Ambassadors for Christ," not only gives the organization its name, but also gives the boys and leaders a lifestyle goal. RA's will be doing missions projects, camp outs, and racer competitions throughout the year. GIRLS IN ACTION (G.A.S) FOR GIRLS IN GRADES 1-5. Girls in Action, for girls in 1st-5th grades, meet each Wednesday evening from 6:15 to 7:00 to pray for missions, engage in mission actions and learn about missions. The girls grow in their knowledge and understanding and application of Bible scriptures. They experience hands-on mission activities through hearing real missionaries such as missionaries serving in Galati, Romania. 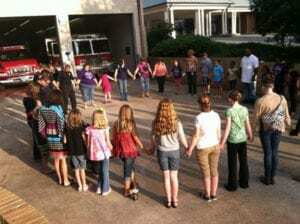 Girls have participated in many mission activities such as walking to the fire station and praying with five of Newnan's firefighters and assisting local families and children with food and school supplies. In November they will be packing shoeboxes for Operation Christmas Child. By hearing about missionaries and mission needs in many different places, the girls discover that God’s mission is worldwide. By doing missions, they learn their responsibility to change the world through our G.A Scripture Verse: “Give thanks to the Lord. Worship Him. Tell the nations what He has done. Announce how honored He is.” Isaiah 12:4. See www.gapassport.com for information for leaders, parents, and girls for mission information and creative activities. Acteens is our Mission Organization for preteen and teenage girls in 6th-8th grades with plans to include high school girls interested in Missions. The girls participate in Mission Study and Mission Action each Wednesday as they meet from 6:15 to 7:00. They learn about missionaries and experience mission opportunities through studying, praying, giving, and memorizing scriptures. 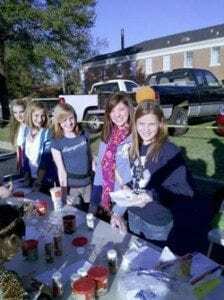 The girls are actively involved in missions in many different ways. Join Acteens…Wednesday nights from 6:15 to 7:00!! Challengers is a missions organization for teen boys in grades 6–8. Through Challengers, young men have opportunities to grow in their relationships with God and their peers. Challengers learn to look beyond themselves and become actively involved in missions and ministry. The boys participate in Mission Study and Mission Action each Wednesday as they meet from 6:15 to 7:00. They learn about missionaries and experience mission opportunities through studying, praying, giving, and memorizing scriptures. The boys are actively involved in missions and serving their church and community in many different ways. Join Challengers…Wednesday nights from 6:15 to 7:00! !